I’ve been taking a closer look at exchange rates recently, given the strong U.S. dollar appreciation in the past year — by extension the Oregon dollar as well — along with the ongoing events in Europe and potential Grexit (Greece exiting the Euro.) I should have more on this in the near future, however here’s something fun. The Portland Timbers have a handful of players from Argentina on their roster and have been heavily linked with adding another Argentine this summer. There are lots of reasons players would want to play in MLS and for the Timbers and plenty of reasons teams would like players from Argentina as well. (Full disclosure: I am a season ticket holder.) Besides the simple fact that Argentina has great players — all of the Argentines on the Timbers are regular starters and/or contributors — there are other factors are play here as well including network effects and exchange rates. In short, network effects in this case would be the simple fact that because Portland already has players from one country on the team, it makes it easier to sign additional players from the same country (provided the current players like it, of course.) Individual relationships between players, in addition to having similar backgrounds and assimilating to American culture all play a part on the player side. From a team perspective, having international scouts you’ve worked with before and doing business with same league, teams and/or agents is likely easier the fourth or fifth time as well. Exchange rates are also likely playing a role here, even as they are not commonly discussed. One U.S. dollar goes a long way these days in Argentina, following two major economic crises in the country in the past 15 years. Textbook economics says a strong U.S. dollar makes imports inexpensive to U.S. consumers and U.S. exports expensive to foreign buyers. This works in Portland’s and MLS’ favor when it comes to bringing in players from elsewhere. Players are, essentially, a type of import in this case. Per the Timbers website, Diego Valeri was first loaned to the Timbers in January 2013, and the club then purchased his contract in August 2013. Maxi Urruti came to MLS in 2013 as well, first to Toronto FC then in a trade to Portland. Gaston Fernandez and Norberto Paparatto both signed in early 2014. Of course the top reason these players are on the team is the simple fact that they’re good players. However, network effects and the exchange rate have helped in allowing a team like the Timbers attract and retain such talent. Nice job working in a soccer post that illustrates network effects and exchange rate effects. While everything you point out is true, you understate the benefit the Timbers Argentine players (and their Argentinian agents) may be receiving as there is an unofficial market premium for (“blue”) dollars in Argentina. Even Argentine government economists admit that the Argentinian peso is significantly overvalued ( http://en.mercopress.com/2012/08/23/argentine-government-economists-agree-the-peso-in-over-valued-and-hurts-non-primary-exports ) and more recently ( http://www.theguardian.com/world/2014/feb/01/argentina-peso-crisis-shakes-queen-cristina ). 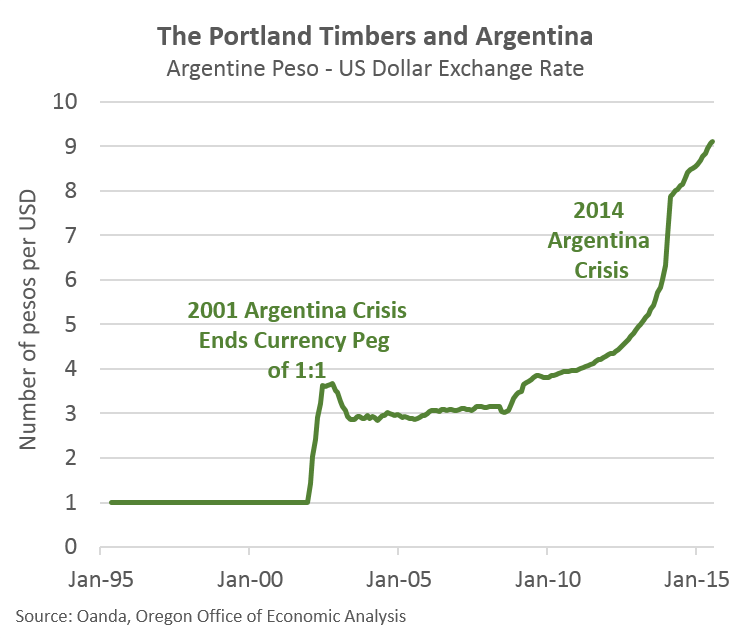 To the extent dollar funds can be transferred to Argentina and used in ways the skirt the intent of the exchange controls (say buying real property in dollars) there are further returns for Timbers players with contacts with Argentina. Perhaps even network effects in Argentina as other Timbers players may be investing in Argentine assets. But this is another deeper step into the world of exchange rates.